Everything I've always wanted to say about the fiddle but find it easier just to put here. There are lots of goodies on these pages for people who like to fiddle or wish to learn. 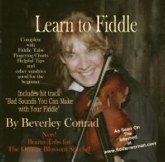 You can listen to the recordings of the tabbed music for the Learn to Fiddle CD at CD Baby. If they are not there already they will soon be available at iTunes, Amazon, Spotify, Apple Music, and most other sources that allow for downloading and streaming. You will also get instructions for how to make a genuine Appalachian Fiddle Mute FREE! This is so that you can practice 24/7 and not upset family or neighbors. You also get two balls of cotton for their ears just in case they still complain. Read about The Origin of Fiddle Tabs! For reprinting this or any other work on this site, please contact me.